Altitude: 1300-1500 meters above sea level. Habitat: The species is epilithic, grows hanging from steep rock faces protruding above the surrounding jungle. Cleistocactus winteri f. cristatus hort. Hildewintera aureispina f. cristata hort. 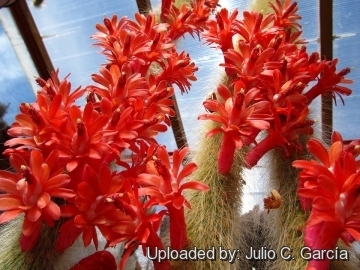 Description: Cleistocactus winteri subs. colademononis, sometimes listed under its old name of Hildewintera colademononis, is a fantastic plant with very long white and soft, hairlike spines. 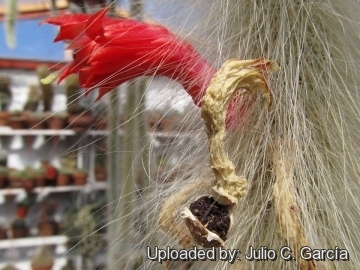 The common name “monkey's tail” refers to the appearance of the hairy stems. It is free flowering and the outsize bright red blooms are particularly decorative. Stems: Cylindrical, light green 2-7 cm across, completely concealed by the spines. Spines: (0 to) 4-8 more or less pointing downward, bristle-like yellowish and 20-50 hair-like, white, 4-8 (up to 12) cm long spines . The hair-like spines grow gradually. Flower: Bright red, 7-8 cm long, zygomorphic, almost horizontal from the the areola. Fruits: More or less spherical, reddish 8-12 mm in diameter, drying and splitting open lengthwise at maturity. Seeds: Black, 1.1-1.4 mm long and slightly curved. They germinate easily. 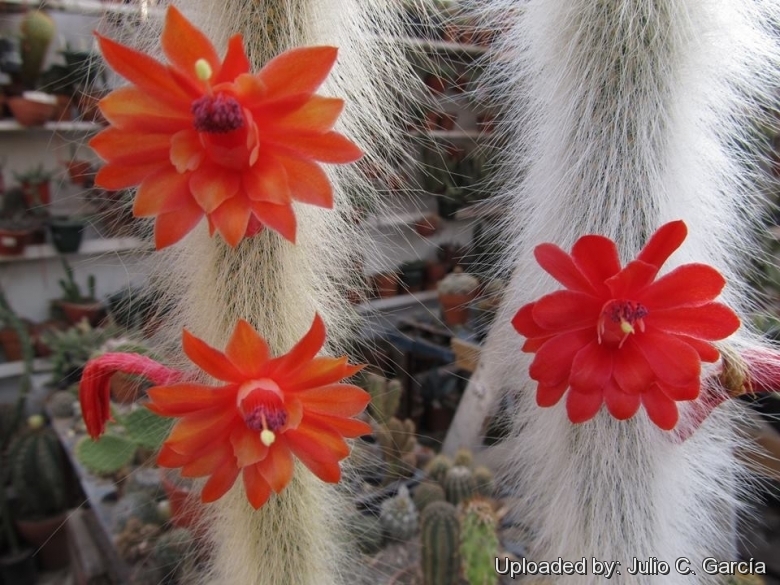 Cleistocactus winteri D.R.Hunt: Produces pendant or trailing stems up to 100 cm in length. 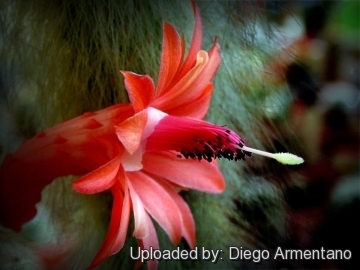 It has very attractive golden spines and flowers are a vivid orange or salmon-pink colour. 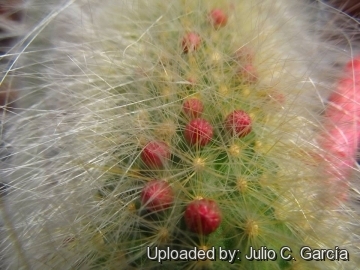 Cleistocactus winteri subs. 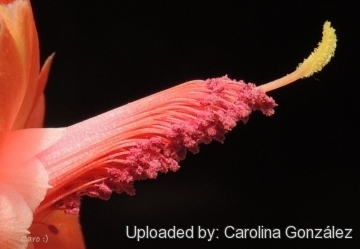 colademononis (Diers & Krahn) D.R.Hunt: has stems up to 2.5 m long with white hairy spines, 4-8(-12) cm long. Flowers red, zygomorphic 7-8 cm long. Distribution: Cerro El Fraile, Santa Cruz, Bolivia. Cleistocactus winteri f. cristatus hort. : This plant forms huge tangled mounds of fairly rapid growth. 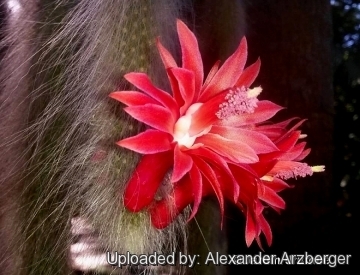 Cleistocactus winteri cv. Ring: It is a very rare circular crest. This particular form of cristation develops at the stems top. 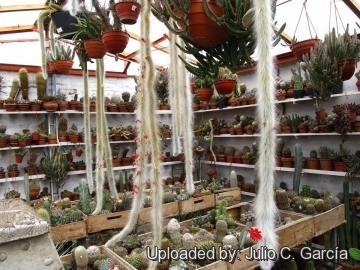 Cultivation and Propagation: Cleistocactus winteri subs. 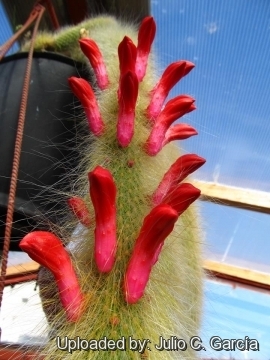 colademononis is of easy culture, which makes it a good cactus for beginners. It suited to hanging baskets as well as pots. Propagation: Easy to propagate from cuttings or seeds. Take cuttings spring or summer, let them dry till the ends callous well. Then replant them in fresh cactus soil that is ever so slightly moist, and keep it that way till they root. Surface sowing is the best; seeds germinate in 14-28 days at 20° C, remembering that seedlings dislike strong light and dry conditions.